This week the House is expected to vote on a balanced budget amendment (BBA), introduced by Bob Goodlatte (R-VA), chairman of the Judiciary Committee. The amendment would require federal budget outlays to equal receipts each year. Subjecting fiscal policy to rules, rather than allowing it to be driven purely by political impulse, would be a good idea, but not if the rules are the ones envisioned by this amendment. Far from stabilizing the economy, this kind of BBA would radically destabilize it, leading to dizzier booms and deeper recessions. Here is why. To see why a balanced budget amendment would undermine stability, we need to understand how the budget affects the business cycle, and how the business cycle affects the budget. 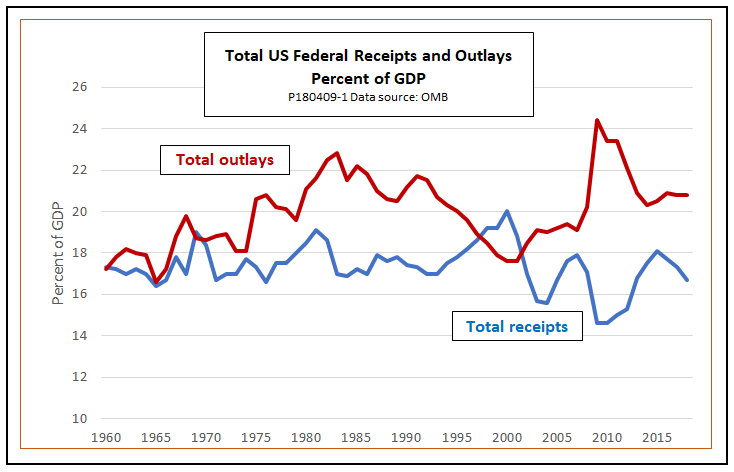 When we look at the pattern of federal receipts and outlays over time, as shown in the following chart, we see a lot of ups and downs. Where do they come from? Politics. Members of Congress have an interest in pleasing their donors and constituents. One good way to do that is to cut their taxes and add spending for their favorite causes in the lead-up to an election. That is true regardless of party and regardless of the state of the economy. Discretionary counter-cyclical policy. As every Econ 101 student learns, the government can soften recessions with tax cuts and spending increases, or cool off booms by cutting spending and increasing taxes. In practice, the tools of discretionary fiscal policy are not used consistently, but there are important exceptions, for example, the fiscal stimulus packages adopted by Congress under Presidents George W. Bush (2008) and Barack Obama (2009) to ease the worst effects of the Great Recession. Automatic fiscal policy. Even when there are no changes in tax or spending laws, the government’s receipts and outlays vary over time according to the state of the economy. In a recession, tax receipts fall along with personal incomes and corporate profits. At the same time, outlays for unemployment insurance, food stamps, Medicaid, health care subsidies under the ACA, and other items increase. During a boom, tax receipts rise and outlays fall. We call those changes automatic fiscal policy or automatic stabilizers because they require no action by the administration or Congress. If a balanced budget amendment did nothing but curb political impulse-spending and tax cuts tailored to the wishes of the donor class, it would be a good thing, but that is not how the BBA now under consideration would work. Instead, such a BBA would destabilize the economy in two important ways. First, a BBA would undermine stability by making it impossible to use discretionary fiscal policy to mitigate the effects of recessions. In 2001, or example, a BBA would have required Congress to respond to the mild recession with tax increases, rather than tax cuts. That recession might not have been so mild after all, and the recovery would probably have been slower. More recently, massive spending cuts and tax increases would have been needed to balance the budget after the 2007-08 financial crisis. A BBA would have made it impossible for the Bush administration to soften the early effects of the 2008 recession with tax rebates, and it would have made it impossible for the Obama administration to pass its more aggressive stimulus program in 2009. The inability to use discretionary fiscal policy would be felt most acutely during crises severe enough to drive interest rates to zero. Since the Fed cannot reduce interest rates below zero, monetary policy becomes ineffective at that point. Arguably, the mild 2001 recession could have been managed using monetary policy alone, without discretionary fiscal measures. The same cannot be said for the global financial crisis and its aftermath. By the end of 2008, interest rates hit their effective zero bound, severely limiting the power of monetary policy. Without discretionary fiscal stimulus, the U.S. economy might well still be stuck in a Japanese-style lost decade, rather than finally making it back toward full employment after a slow recovery. Wisely, the BBA now under consideration lifts the annual balance requirement in time of war. At a minimum, it ought also to relax the constraint whenever the Fed advises Congress that interest rates have hit the effective zero bound. 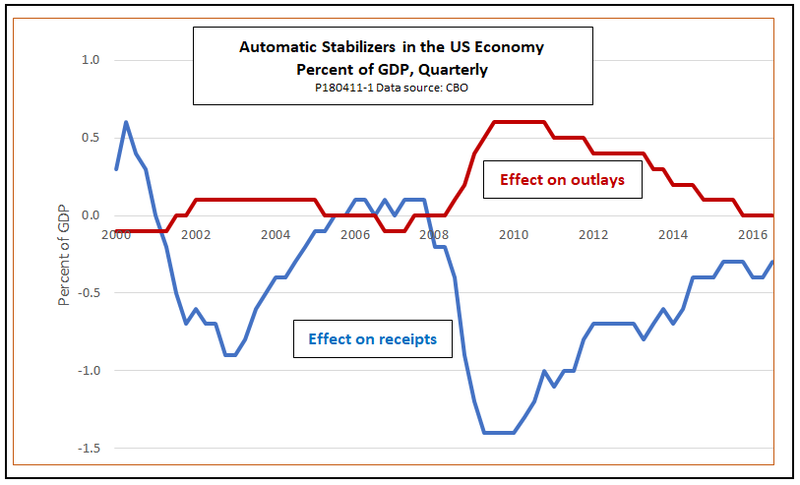 A second, and even more serious, flaw is that a BBA would disable the economy’s automatic stabilizers, replacing them with automatic destabilizers. Under current rules, when the economy enters a recession, falling tax receipts and rising outlays automatically moderate the decreases in aggregate demand that are brought on by contraction of the private sector. Under a BBA, automatic stabilizers would have to be offset by some combination of mandatory tax increases and spending cuts, which would add to the economy’s downward momentum. In 2009, the actual budget deficit reached 9.8 percent of GDP, as the first chart showed, but, as we see here, the deficit would have been 2 percent of GDP even without the effects of the discretionary Bush and Obama fiscal stimulus. A BBA, in effect, would have required more than just forgoing discretionary tax cuts and spending increases. It would also have required Congress to enact tax increases and spending cuts equal to another 2 percent of GDP (to offset automatic spending). With federal outlays running at about 20 percent of GDP, that would mean tax increases or spending cuts equal to some 10 percent of the total budget. Those are only static estimates. They assume that tighter fiscal policy would have done nothing to deepen the recession, even at a time when zero interest rates severely limited the power of monetary stimulus. My back-of-the-envelope dynamic estimates suggest that for 2009, a BBA would have mandated spending cuts and tax increases closer to 15 percent of the federal budget. It is not too much to suggest that such measures would have made the Great Recession into another Great Depression. Since the BBA is unlikely even to make it through Congress, much less through the entire ratification process, I don’t want to spend too much time on its more technical defects, but two are worth at least a mention. One is its vagueness about the actual mechanisms for ensuring budget balance. Section 4 requires that the president submit a balanced budget plan before the start of the fiscal year, but such a plan would necessarily be based on estimates of outlays, receipts, and GDP. It is not clear what would happen if those estimates turned out to be unrealistic, and the budget ended up in deficit despite the best intentions of Congress. Section 7 of the BBA gives Congress the power to establish rules, including rules for estimating outlays and receipts, but what kind of rules? Would they treat bygones as bygones—that is, if an unexpected deficit developed, would the shortfall be allowed to go uncorrected? If they did, the Office of Management and Budget’s historic penchant for overly optimistic economic projections would, over time, cause the debt to grow. Raising the debt limit would, under the BBA, require a three-fifths vote of both houses of Congress. That would make the chronic debt-limit chaos we now have even worse. If, on the other hand, Congress required any unexpected deficit in one year to be made up by an equivalent surplus in the next year, the inherently pro-cyclical nature of the BBA rules would be made even worse. Section 5 of the BBA, which requires a three-fifths vote of both houses for any tax increase, but only a simple majority for a tax cut, poses a further problem. In the past, Congress has had a tendency to cut tax rates during periods of prosperity, when automatic stabilizers move the budget temporarily into, or close to, surplus. That would require only a majority vote. Restoring taxes to their previous level during a downturn would, however, take a three-fifths vote. In practice, that means that the austerity measures required during a recession would be much more likely to take the form of spending cuts, which could be passed by majority votes, rather than tax increases. Such a procedure could set up a ratchet effect that would gradually diminish the ability of the federal government to meet its essential obligations. There is a good case to be made for fiscal policy rules. Without them, fiscal policy as we have known it has been pro-cyclical almost as often as it has had a moderating influence on the business cycle. Unfortunately, the balanced budget amendment that Congress is preparing to vote on would make things worse. It would end up requiring fiscal policy to be pro-cyclical almost all the time. Are there alternative rules that would work better? Yes. Many other countries have them. One simple variant is that followed by Chile, long the most prosperous country in South America. The Chilean rule aims to balance the structural budget, rather than the actual budget, each year. The structural budget refers to the levels of spending, taxes, and the deficit that prevail when the economy is at full employment. A structural balance rule, unlike a simple-minded BBA, thus allows full operation of automatic stabilizers. Sweden follows a more sophisticated set of rules. The Swedish rules also require budget balance over the business cycle. However, compared to the Chilean rules, those in Sweden allow greater scope for discretionary counter-cyclical fiscal stimulus during recessions, provided it is balanced by appropriate surpluses during booms. U.S. conservatives should love the fact that Sweden has steadily reduced its debt-to-GDP ratio since its fiscal rules came into force. So yes, rules for fiscal policy are a good idea. But any rule that requires annual balance of the actual budget takes a good idea and stands it on its head.